Katherine Raymond "Yes weed can!" There's a video clip circulating of Mark Ryan and Jamie Lowell meeting on the U-M Diag and smoking a joint sometime before 9 a.m. on Hash Bash day. Maybe they were the first of many thousands of people to do the same a few hours later as Rep. Debbie Dingell spoke, and a recorded message of support from Gov. Gretchen Whitmer was played over loudspeakers. 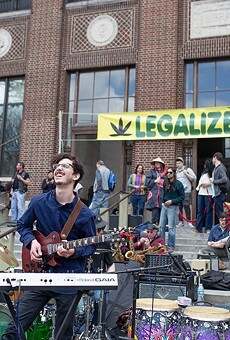 The 48th Hash Bash was a huge and meaningful victory party for Prop. 1, which legalized recreational adult-use marijuana in Michigan after voters approved it in November. But was it literally the Hash Bash to end all Hash Bashes? The stuff is legal now — let's get on with the party, right? At least that's what some folks were talking about in the crowd. The first bash in 1972 was a public demonstration before marijuana was recriminalized after a brief respite in Michigan. It became a protest and rallying point over the decades, but we've reached the goal — so why carry on? "I wouldn't agree with that," says Hash Bash co-organizer Nick Zettel. "If legalization was the only purpose Hash Bash served, then it wasn't successful for 47 years. It's going to continue to go that route, things are really looking up for the event. We had some really accomplished speakers. The governor's address this year, that is certainly something the planning committee feels really good about." As the old saying goes, if it feels good, do it. And the committee is feeling good. When you really think about it, the Hash Bash is a great tradition that is a good thing overall for the city of Ann Arbor. We're talking about the core Hash Bash here, not the cannabis fest that goes on for three days with bands, panels, classes, and contests, and thousands of people coming to town to spend money. If it was bad for the city of Ann Arbor, all that stuff wouldn't be happening. The core protest of the Hash Bash has been a beacon to marijuana users nationwide. Before you could smoke marijuana legally anywhere, you could go to the Hash Bash and fire up openly and proudly. Seldom did police arrest anyone for indulging. What the bash has represented over the years has made the day and the site historic for the marijuana legalization struggle. Without the Hash Bash at its center the cannabis festival weekend becomes a hollow party devoid of meaning. Even though marijuana has been legalized in Michigan, there are still many roadblocks to fully implementing the benefits of that legalization — removing the stigma against it, improving medical research, and achieving legalization at the national level. The Hash Bash is expanding its function as a litmus test for politicians who can make those changes happen. The event has steadily garnered more and more politicians from the city of Ann Arbor to their representatives in Lansing. When former New Mexico governor Gary Johnson made a presidential run in 2011, he made a stop at the Hash Bash. This year Dingell represented the first sitting federal official to speak there. "We want to continue to give pro-cannabis candidates a platform and to hold their feet to the fire," Zettel says. "We want to keep a focus on improvements to the law and to protect the good parts of the law." It will be a victory when we see the governor speaking live at a Hash Bash rather than sending a recording. That politicians are willing to speak openly in support of marijuana is a growing trend. A lot of politicians follow behind where the people have already gone, and that is the case in spades for marijuana. Now that politicians are figuring it out, more and more states will legalize marijuana soon. It is entirely possible that in a couple of years every state that touches the Great Lakes (except Indiana) will have legalized marijuana. Michigan can have an identity and uniqueness in the cannabis crowd with the Hash Bash. The popular marijuana website leafly.com has a 2018 article titled "8 cannabis festivals that changed the game." Hash Bash is at the top of the list. There's history here and a cannabis-friendly town hosting the event. It gives marijuana tourists an extra reason to consider Michigan. Legalization in Michigan is one battle in the war against prohibition. The fact that we still have a dysfunctional medical marijuana system 11 years after passing that law shows that it takes more than just passing a law to get the job done — not to mention federal prohibition is still used as the excuse to limit research on medical aspects of marijuana, and to deny businesses normal financial services, among other things. So there is plenty of reason to keep the Hash Bash going. Besides, after 48 years, how could you stop the party before celebrating the 50th anniversary? There are bigger cannabis festivals. The Seattle Hempfest has the advantage of being scheduled in the summer, though it's only been around since 1991. There has been many a Hash Bash dampened by cold and wet weather. 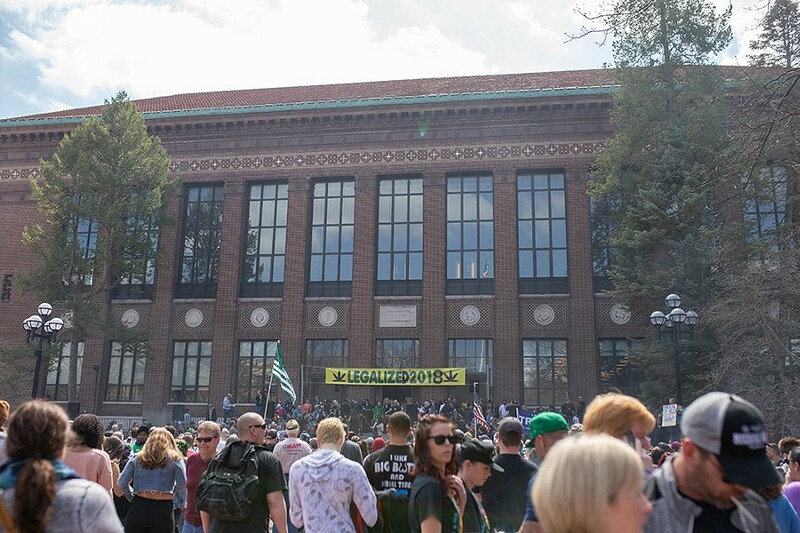 Still, the Hash Bash is so ingrained into our DNA that I believe that if it were abandoned as an official event, people would still show up on the first Saturday in April to smoke marijuana on the Diag at U-M. There would be a lot of people, and it would go on for years and years. 'Twas the night before Hash Bash ... and I was walking along Michigan Avenue and happened upon a group of people smoking a blunt outside a bar. So I stopped to chat with them. I asked what they thought of legalization, and found a wide divergence of opinion. One woman said she didn't like it and wished folks had left legalization alone. She liked the black market system just fine. Another woman got right into the idea that fewer black folks will be getting arrested and harassed because of marijuana. Score that a plus for legalization. Either way, they were all getting high in public. It was a small act of civil disobedience in the same way that Ryan and Lowell did the next morning in Ann Arbor. The folks on Michigan Avenue were just four of the hundreds, if not thousands, of folks who smoke publicly in Detroit every day. It used to be cool to sneak around and find a place in public to indulge in marijuana. Now people just do it and take pictures of it and send it around. People stand on the street smoking while other people are passing by. So things have loosened up. For a little perspective, consider that I was out with a friend visiting from California. During the course of our evening he said to me, in disbelief, "You mean there is not one store in the state of Michigan where I can buy marijuana?" Despite all the hoopla of the Hash Bash, we've still got a ways to go. It's a new era for marijuana in Michigan. Sign up for our weekly weed newsletter, delivered every Tuesday at 4:20 p.m.